Update 4/25/2013: I would not have guessed that this would reach $29,100. Seventeen people wanted it, so that had to help. 4/17/2013: 1900 Touring Coupe AR1900C*10476. I had lunch today with some fairly well equipped Italian car enthusiasts and the subject of ‘what do you buy now-a-days’ came up. I complained (not sure that’s the perfect word) that the days of Fiat 8V’s, Siata 208S’s, Lancia Aurelia’s and other interesting coach-built stuff available as projects seemed to have passed, that my generation had to make do with the sort of ‘hold-overs or left-overs’ from the golden age unless smiled upon by fortune. A fairly quick response from a Giulietta Sprint Veloce Confortevole owner was “what about 1900 Alfa’s?”. “Beautiful but complicated for the performance” was my response -but I kept asking myself on my way home. “What about 1900 Alfa’s?” The Touring Coupe’s are lovely cars. 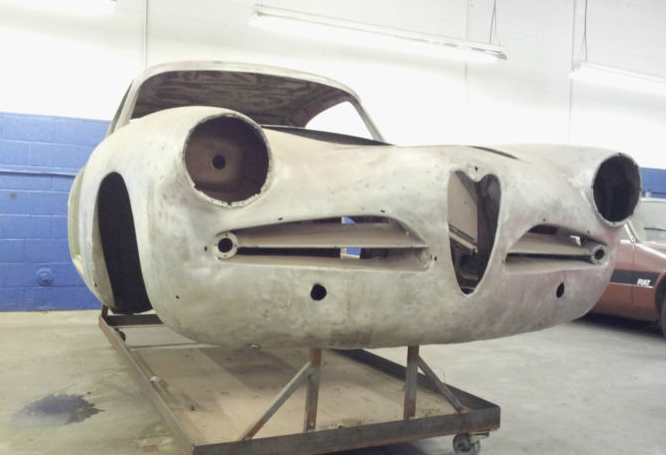 Projects aren’t rare and nice cars are fairly affordable in the grand Alfa scheme. What about 1900 Alfa’s indeed. This jumping-off point in my exploration is available on eBay now. The Giulietta Spider enthusiasts are noting that at first glance it looks quite familiar -besides the roof anyway. In person you’d never make this connection -the 1900’s are a good 110% the size of a Giulietta. Metal here all looks great.